Pete the Purple Bull is excited to announce the debut of his first original musical; Pete's Grand Plan - an event filled with upbeat, lively music, dancing and laugh-out-loud scenes. Pete's Grand Plan – the Musical debuts Saturday, November 3rd, 2pm at the North High School Auditorium in Davenport, Iowa. Sunday November 4th at 1:30pm, children and parents will have a special opportunity to eat lunch with Pete the Purple Bull and his Harmony Farm friends. Miss Iowa, Mikhayla Hughes-Shaw, will also join the fun. The luncheon will feature pizza and ice cream, two of Pete's favorite foods. There will also be picture opportunities and other activities. The musical will follow at 3pm. 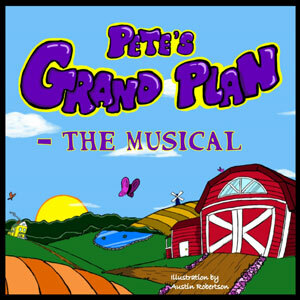 Pete's musical is based on Pete's first children's book entitled Pete's Grand Plan. The book was written by Kim Riley-Quinn, a school social worker and private therapist and illustrated by local artist, Austin Robertson. Both the musical and the book are designed to provide a fun, interactive experience for children and families that promotes a bully-free environment and the importance of personal self-care. The musical is directed by Mandy Collins and is a collaborative effort between a talented group of Quad Citizens that includes Juan Valtierra, Victoria Viren, Kellen Meyers, Bibek Adhikari, Jordan Atwater, John Viren and many others, all of whom believe full-heartedly in the power of kindness.